Chinese weapon has full of opportunities to penetrate the Thai market, after artillery system by WS-1B and WS-32, China continues to offer S-20 submarines for Thailand. This transaction will be significant because Thailand has no previous experience using submarines. Although he expressed interest in submarine production by China, Thailand however still no official response regarding this invitation. 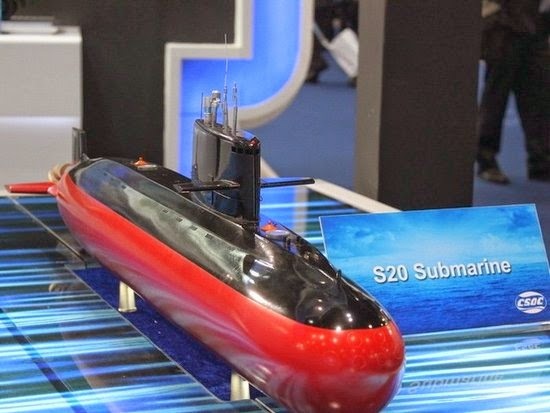 According to what China claims, submarine S-20 was designed by this country and production, but according to what was published, the S-20 is a copy of the Kilo class submarines from Russia. S-20 has a length of 66 m, a width of 8 m, height 8.2 m, as well water displacement of 1,850 tons when submerged water displacement of 2,300 tons, speed 18 knots/h, distance of journey speed 16 knots/h is 8,000 nautical miles. S-20 crew of 38 people, independent operation time of 60 days and nights. This double hulled submarine can dive to 300 meters deep. Kilo S-20 similar not only in design but also in superficial details like the wings tail fins help train changes direction. S-20 is equipped with acoustics stations system to detect changes in frequency, 1 sonar intercept receiver and sound-velocity measuring systems to measure the noise of the ship itself. In addition, the ship has the ability to drop a towed acoustics stations. S-20 is equipped with torpedoes, mine spreader system and anti-ship missiles.